The Missouri Department of Conservation (MDC) awarded two local TV stations with the 2018 Outreach and Education External Partnership Award. Communication, public outreach, and education have always been a top priority for the MDC. Conserving fish, forest and wildlife resources requires public appreciation and support. Each year, MDC’s Outreach and Education Division recognizes one external partner in Missouri for their significant contributions to conservation outreach that benefit the community, MDC, and Missouri citizens. The Fox 2 KTVI and KPLR-11 television stations in St. Louis were selected to receive the statewide 2018 Outreach and Education External Partnership Award by MDC for their outstanding public service efforts and exemplary support of conservation for the last 10 years. Read more from the MDC information release below. The sister stations are owned by Tribune Broadcasting and serve a large and diverse viewing audience in the St. Louis Metro Area, which consists of approximately 250 million people. Both stations operate at a joint facility in Maryland Heights. Since April of 2009, KPLR-11, and more recently Fox 2, have hosted the weekly Conservation Connection interview segment each Wednesday during the midday newscast. 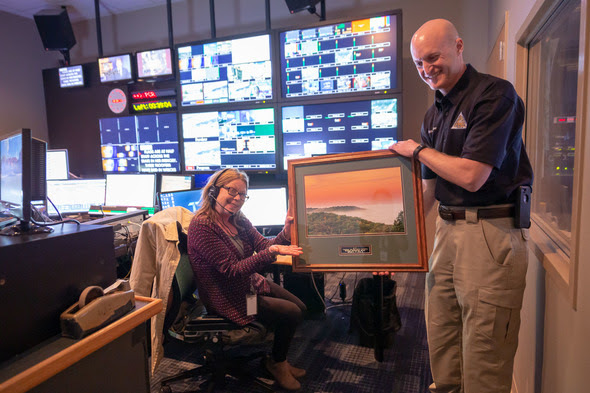 Additionally, the news team regularly welcomes conservation staff on their highly-rated morning newscasts and 9 a.m. show to let the public know about MDC events, important issues in conservation, and other ways to discover nature. Fox 2 and KPLR-11 have been offering this resource as a free public service for 10 years. Gruber presented the award live on air last week during the April 3 Conservation Connection. The segment also marked Conservation Connection’s 10th anniversary. “MDC appreciates the efforts of Fox 2 and KPLR-11. These two stations undoubtedly help Missourians better understand and appreciate the value of nature. We thank them for their long-standing support and partnership!” Gruber said. The Conservation Connection TV segment can be seen each Wednesday during the 11 a.m. newscast on Fox 2 in St. Louis. This entry was posted in Home, Outdoor/Nature. Bookmark the permalink.